This is a Baja Sea Kayaking Paradise! Come experience Baja sea kayaking paradise and give us the chance to show you the remote areas, which include the exceptionally beautiful Midriff Islands. This island chain consists of more than 20 islands, which are surrounded by sea lions, whales, tropical fish, dolphins, enchanting blue water coves and virgin white sand beaches. 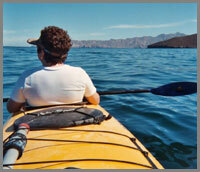 The charming islands and dramatic coastlines combine to create an unforgettable Baja Mexico kayaking experience. After a short 2 1/2 hour flight south of San Diego, you soon find yourself looking out over one of the most brilliant island filled bays in the world, known to the locals as the Bay of the Angels. 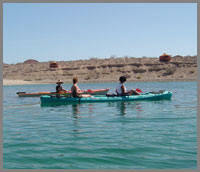 You will reach Las Animas Wilderness Ecolodge, after a short boat ride. Las Animas, a year-round soft – adventure, multi-activity, wilderness vacation retreat just 10 miles southeast of the nearest town. 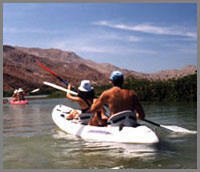 Our Baja sea kayaking trips are the ideal break for couples, singles, active seniors and families. Our guides will provide you as little or as much assistance as you need. The majority of our trips are based from Las Animas Ecolodge, while some guests prefer a camp experience. We can create a custom adventure to your needs; just let us know what you are looking for. You’ll enjoy our tandem and single, unsinkable Seda Expedition Kayaks and Ocean Kayak Scramblers as you go about exploring the incredible reefs and endless romantic coves. 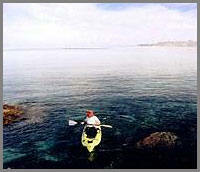 For the more experienced and serious kayaker, we also offer fully enclosed expedition style sea kayaks. What better way to experience the breath taking Midriff Islands than by getting as near to the shoreline as only a sea kayak will allow! Call if you want to create your ultimate custom adventure! Comments from dozens of guests. Join us and find out for yourself!